If you are considering purchasing a new RV, then you may be wondering whether you should store your new RV on your property or if you should rent a space at a covered RV storage facility. To help you as you try to make this important decision, here are just a few of the benefits of choosing covered RV storage. If you are like most homeowners, then it is likely that you do not have the space or resources to build covered RV storage on your property. This means that if you choose to store your RV at home it will be exposed to the elements including wind, rain, and the sun’s harsh UV rays. Over time, direct exposure to the sun can cause your RV’s paint and decals to fade, and it can even fade the fabrics within your RV. By storing your RV at a covered facility you can help to protect it from the elements, which can go a long way in maintaining its look for years to come. Another issue with storing an RV on your property is security. Even if your RV is behind a fence, it will still likely be visible from the street, making it a prime target for burglars. However, at an RV storage facility, your RV will be protected by layers of security. In addition to being behind a locked gate, your RV will be in an area that is under video surveillance and that it regularly traveled by employees and other RV owners, greatly reducing the likelihood that thieves or burglars will be able to get to your RV. Unless you have a large plot of land, then you may be restricted to looking at RVs that will fit in the storage space you have on your property. 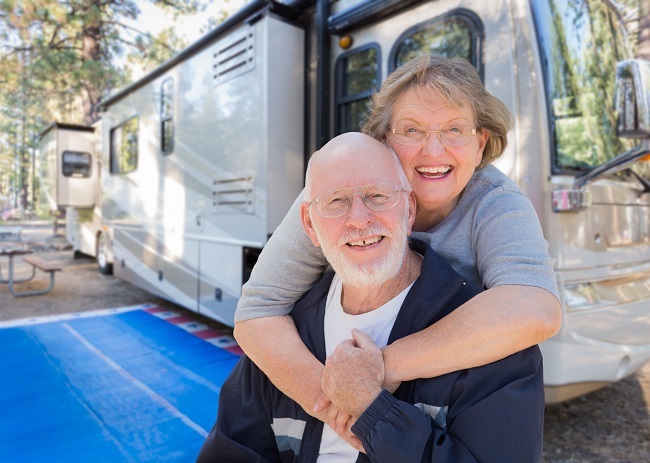 This means that not only will your choices be limited, but even if you find the right size RV you may still struggle to get it in and out of your property. This is where renting an RV storage space can be useful, as storage facilities have large spaces and a variety of different sizes to choose from, which will allow you to easily store any size RV you want. Contact us to learn more about the reasons why you should consider covered storage for your new RV.